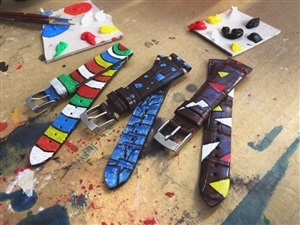 The first collection of straps entirely hand-painted by the artist YCC's brush is now online on our digital store www.ilcinturinostore.it in the 'hand painted' section. The collection entitled 'Nouvelle Vague' is composed of three unique pieces and is inspired by the stylistic games of lights and colors present in the works of the director Jean-Luc Godard, progenitor of the current of which our collection bears the name. A riot of colors and geometric games that convey a great sense of dynamism and modernity. All made with colors fixed on the skin to prevent any possible color deburring. So fashion and art come together in a very special limited edition collection, run to our store and do not miss it!